Founded by Ian Ayres and inspired by Allen Ginsberg, Van Gogh’s Ear: Best World Poetry, Prose & Art is an annual anthology series devoted to publishing powerful works by major voices and innovative new talents from around the globe. The goal of Van Gogh’s Ear is to make each volume a real eye-opener that stirs people’s emotions and ignites their imaginations. Experimental work is warmly embraced. 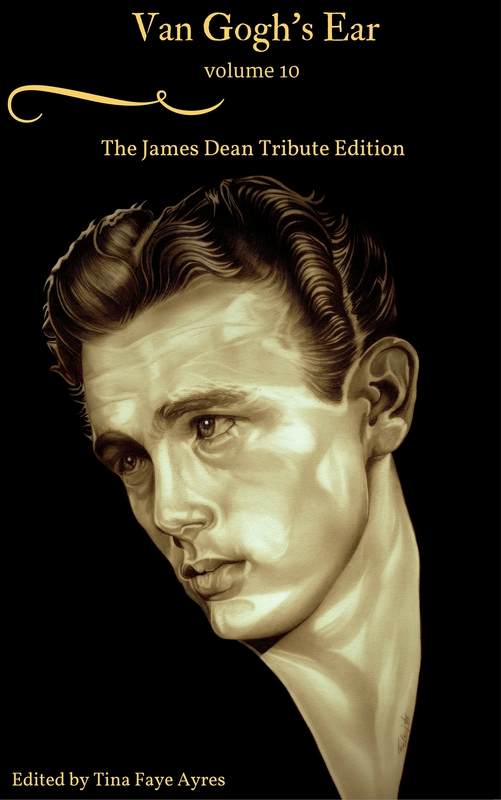 The tenth volume of the series, in honor of the 60th Anniversary of his death and his 85th birthday on February 8, 2016, also humbly offers up a section dedicated with the sincerest of admiration and gratitude to James Dean. The section features interviews with Lew Bracker, Brenda Hayes, Jim Hayes, Val Holley, Mark Kinnaman, Cody Mullins, David Nall, Roy “Oily” Phillips, Denn Pietro, Lee Raskin, Steve Rowland, Grant County’s own local filmmaker Michael Mathias, and Charles Paul Waters, as well as artworks from Demetrie Kabbaz,Chris Burns, John Gilmore, Fred Larucci, Paul Lovering, Matt Pecson, Enric Torres-Prat, Andrew Read, and Brian Tones. Featuring a poem by A.D Winans as well as a note from the editor and a foreword from filmmaker/creator of Van Gogh’s Ear, Ian Ayres.